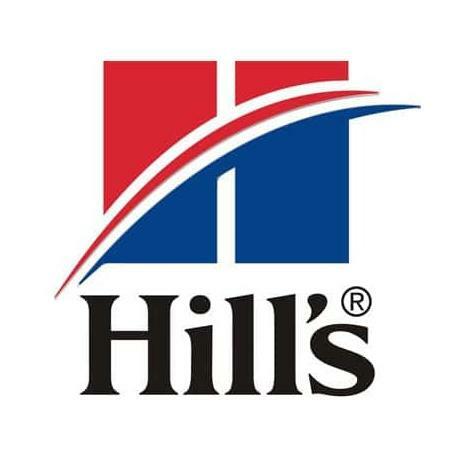 Hill’s in a 85g can is a chicken flavoured cat food for active mature adult cats from 7 years old. Some older cats may suffer from sensitive teeth and gums and this easy-to-chew food will cause them no discomfort. 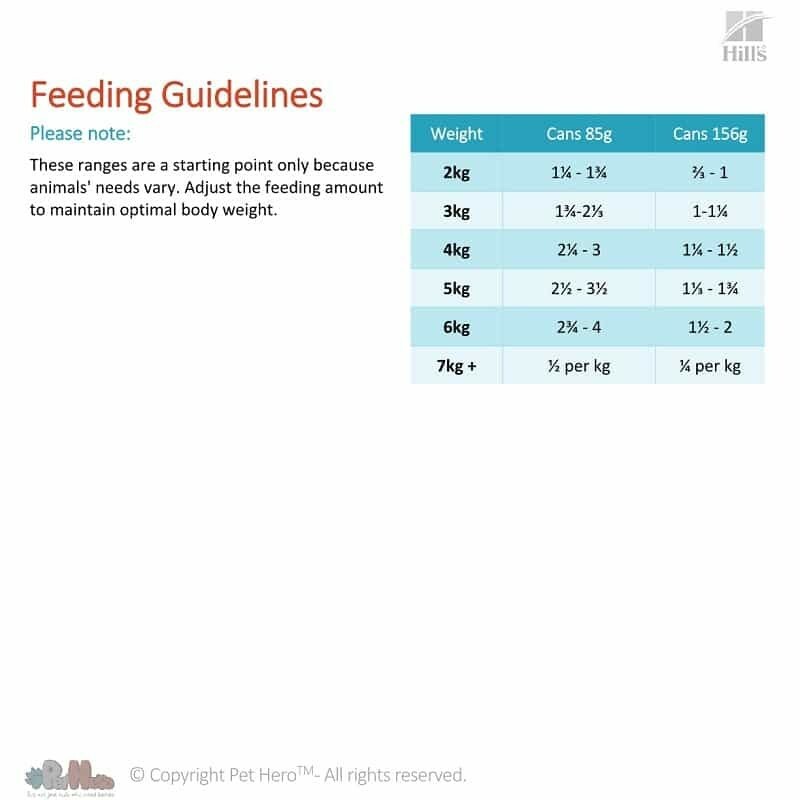 Cats older than 7 years have different nutritional needs. Their kidneys are vulnerable and too much phosphorus can be harmful. 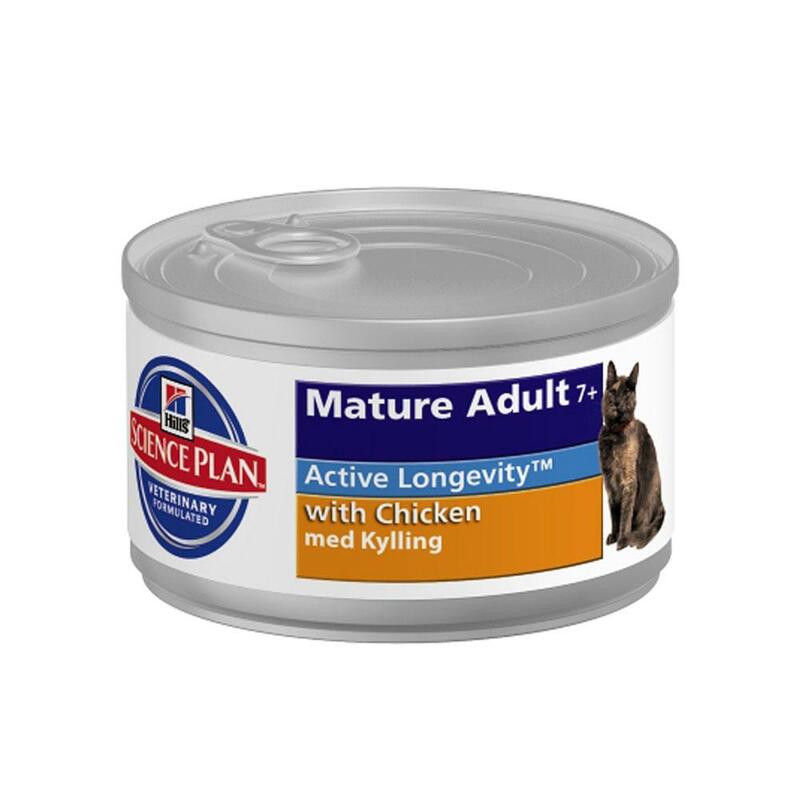 Hill’s Feline Mature Adult took this into account when they developed this delicious soft food recipe for ageing cats with sensitive teeth, gums and digestive systems. 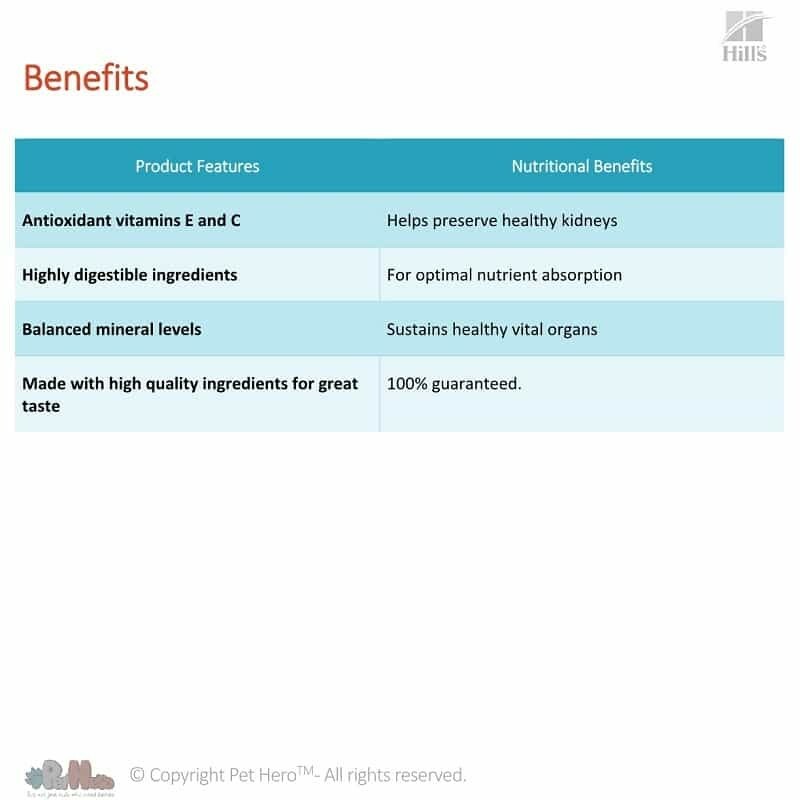 One can of Hill’s goodness and your feline friend will receive exactly what her body needs. The food has highly digestible ingredients for optimal nutrient absorption. It is made with high quality ingredients for great taste. Fibre – Plays an essential role in your kitty’s digestive, heart and skin health, and it may improve blood sugar control and weight management. Fibre also helps prevent Constipation. Omega 3 & 6 – Omega-6 and omega-3 fatty acids are vital for skin and coat health. Phosphorus – helps with the formation of bones and teeth. Is also needed for your old ones body to make protein for the growth, maintenance and repair of cells and tissues. Potassium – Your kitty’s body needs to work normally. Potassium helps nerves and muscles to communicate. 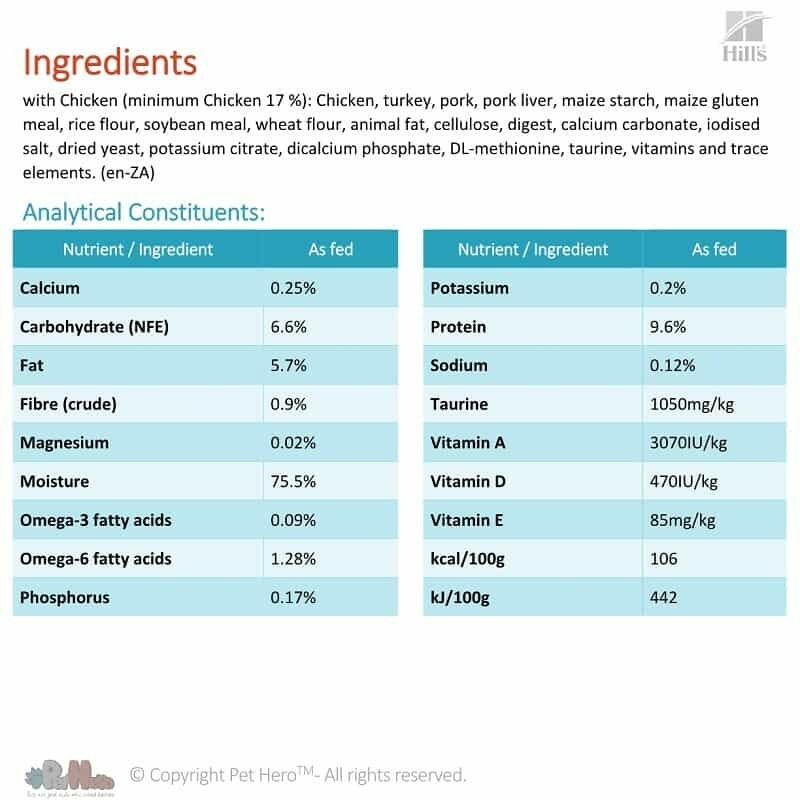 Vitamin A – maintains your kittys skin, teeth, skeletal and soft tissue and good vision. Vitamin D – Keeps your mature ones bones and teeth healthy, and support a healthy immune system.